Presume is a verb that means to suppose, to take for granted, or to dare. Assume is a verb that means to suppose, to take for granted, to take upon, to don, or to undertake. In the shared meaning of “to suppose,” presume is usually used when you suppose based on probability, while assume is used when you suppose without any evidence. 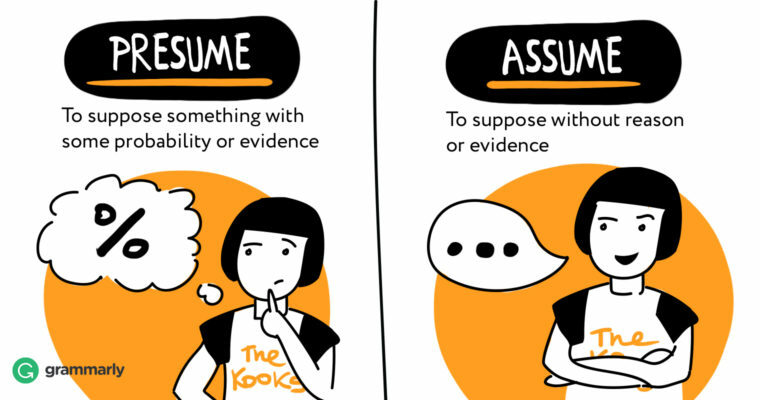 What’s the difference between “assume” and “presume”? “Assume” is to “presume” as a brother is to a sister. The previous statement is an analogy, a comparison of how two things relate to each other. Analogies are used to explain or to clarify. For those who confuse “presume” and “assume,” an analogy is just the thing! Just as a brother and sister have the same parents, “assume” and “presume” have the same etymological roots. “Assume” has Latin roots. It comes from a verb that means “to take up or adopt.” “Presume” derives from a Latin verb that means “to take upon oneself, to take liberty, or to take for granted.” Both Latin verbs can be traced to a common root, sumere, which means to put on or take up. A brother and sister are not interchangeable. Because of their unique personalities, parents may give them different chores. Assume and presume have different meanings and usages. To presume also means “to take for granted” or “to suppose,” and just like assume, it has another meaning as well. “To act or to undertake with undue boldness or without permission” is another meaning presume can take on. In law, it refers to accepting something as true in the absence of proof of its falsity.